Preseli 41 pet friendly caravan. This comfortable privately owned caravan is a 36 x 12 Atlas Solitaire Super with a double en suite and twin bedroom, plus family shower room, excellent sea views, and well equipped kitchen. Just a few minutes walk down to Traethgwyn Beach or to the Haven Park Splashzone and Entertainment Centre. 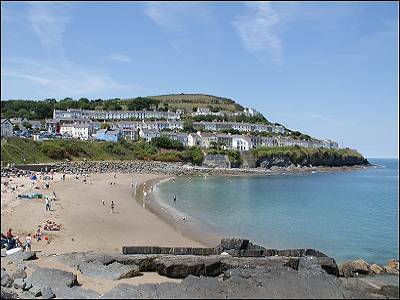 New Quay is a short drive along the Bay, where there is a wide choice of pubs and restaurants ,dolphin watching and fishing or dive boat trips and a Watersports Centre. This centrally heated, double glazed caravan has a spacious sitting area with comfortable sofas and sea views towards New Quay and across Cardigan Bay , TV and DVD player and stereo. The dining area seats 6 and the well-equipped kitchen is fully fitted with large gas cooker, microwave , fridge and all the usual small appliances, glasses, crockery, cutlery and cookware. The Caravan sleeps 4 to 6 with one spacious double with an en-suite (WC and wash basin) and one twin bedroom. There is also a 'pull out' sofa bed in the lounge. The family shower room has a double sized shower with mini bath, WC and wash basin. Travel cot available. Outside there is good access to this caravan with a ramped deck area and no steps up to the door a table and chairs for sitting out and watching the sun set over New Quay after a day on the beach. There is car parking space alongside the caravan. Duvets and pillows are provided, but guests must bring their own tea towels, personal and beach towels and bed linen ( bottom sheets, duvet and pillow covers). Up to 2 well behaved small to medium sized dogs allowed. 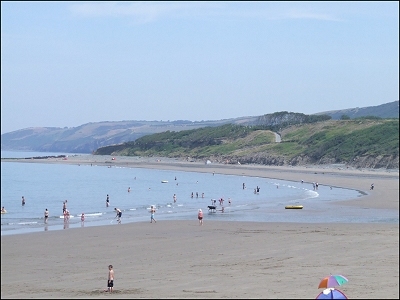 Quay West Holiday Park provides direct beach access to Traethgwyn Beach - see photo above - a wide sandy beach that you can walk along all the way to New Quay at Low tide. Quay West Holiday Park is a family holiday park and we cannot accept bookings from all male or all female parties. Sorry no smoking allowed in the caravan.